This Gibson Flying V guitar was used on several Nazareth albums, tours and TV specials from 1976 onwards. 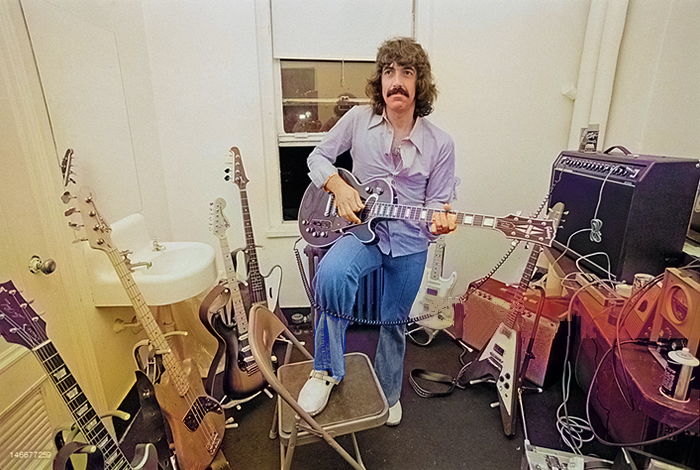 The guitar was used on Nazareth studio albums "Play'n' the Game" (1976) and Expect No Mercy (1977), and it was also featured in several TV shows,"Alice Cooper and Friends" live music television special recorded at Anaheim in California (1977) and BBC's Sight and Sound TV show (1977). The latter TV show which was later released on DVD under the name "From The Beginning" (2005) and the Audio CD "Live at the Beeb" (1998). 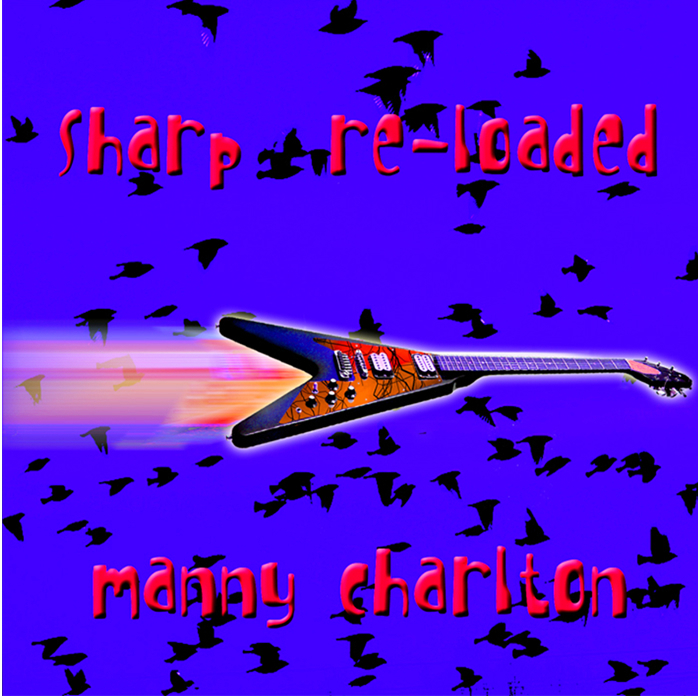 Manny Charlton also used this guitar on the cover of his solo album "Sharp Reloaded" from 2005. It was sold to the current owner in 2015. The guitar remained in Manny Charlton's possession until April 2015. The above picture was taken in 2017. By 1975, Nazareth was riding high in the charts and touring the USA in support their breakthrough album "Hair of the Dog". The single from that album "Love Hurts" is still Nazareth's most successful chart success in the USA, reaching No. 8 in the Billboard Hot 100 in early 1976. 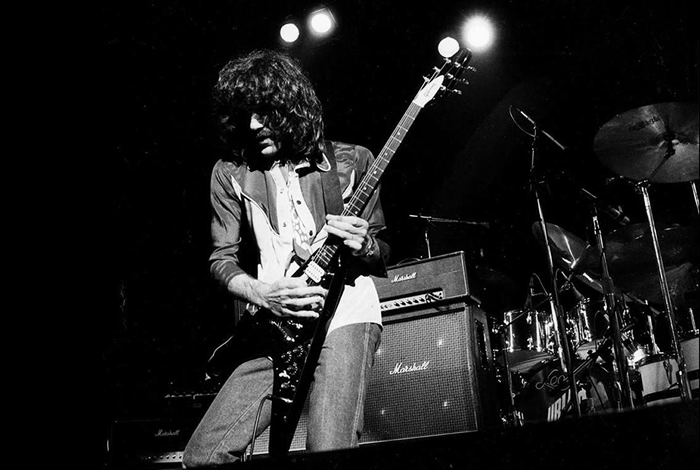 It was during the 1976 USA tour that Nazareth guitarist Manny Charlton purchased this Gibson Flying V guitar from a guitar shop in Tucon (Arizona, US) along with a Gallien Kruger amplifier. When Manny got back to the UK, he had it customised by UK luthier John Birch. 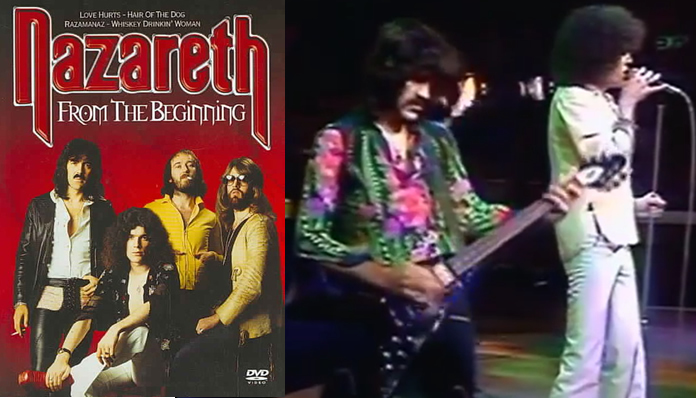 Manny Charlton subsequently used this guitar to record the Nazareth albums Play'n' the Game (1976) and Expect No Mercy (1977). The guitar can be heard on the recordings of 'Kentucky Fried Blues', 'Down Home Girl' and ‘Flying”. He also used this guitar on on several tours in the late 1970's, and it can be seen in the "Alice Cooper and Friends" live music television special from 1977 ( released on VHS in 1978). 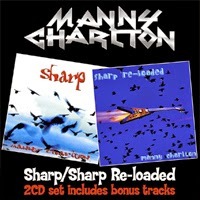 Later, the guitar was also used on the cover of Manny Charlton's "Sharp Reloaded" album from 2005. Manny Charlton spared no expense customising this guitar. The custom job was done by John Birch (1922 – November 6, 2000) who was well known for making electric guitars. John Birch's customers included Toni Iommi and Geezer Butler of Black Sabbath, Brian May of Queen, Dave Hill and Jim Lea of Slade, Gerry Shephard of The Glitter Band, and Roy Orbison. John Birch added a Gibson TP-6 fine tuning tailpiece (made by Schaller for Gibson), Schaller machine heads, DiMarzio Super Distortion Humbuckers, a phase switch, a flash-looking metal pick-guard and refinished the guitar to a dark sunburst colour. 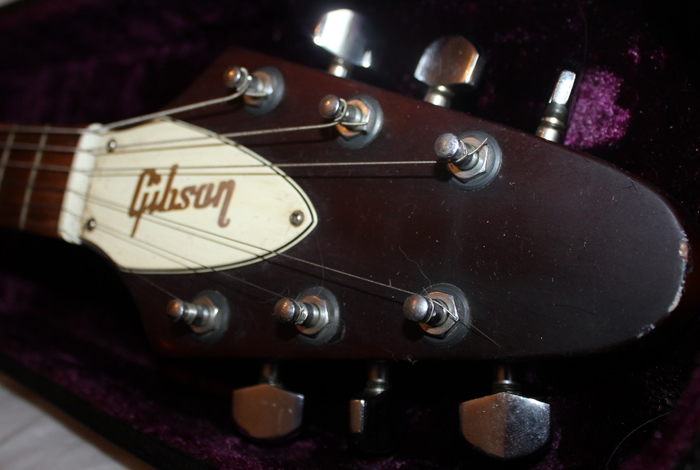 Serial Number: 525540 – Made by Gibson in the USA. Note: the serial number is quite hard to decipher, because the guitar was re-painted in a dark sunburst colour by the luthier John Birch in the 1976. However, on close inspection, when held up in the light at a certain angle, the serial number at the back of the headstock is revealed number 525540. Manufacturing year: This guitar is of the 500000's series Gibson Flying V guitars, which was manufactured between 1974-1975, according to official Gibson records. Machine Heads: fully enclosed machine heads from Schaller (German high-end manufacturer), refitted by guitar luthier John Birch. Interestingly, the inscription of these heads read “Manufactured in W Germany”, ("W" for "West") as they were produced before the re-unification of Germany. 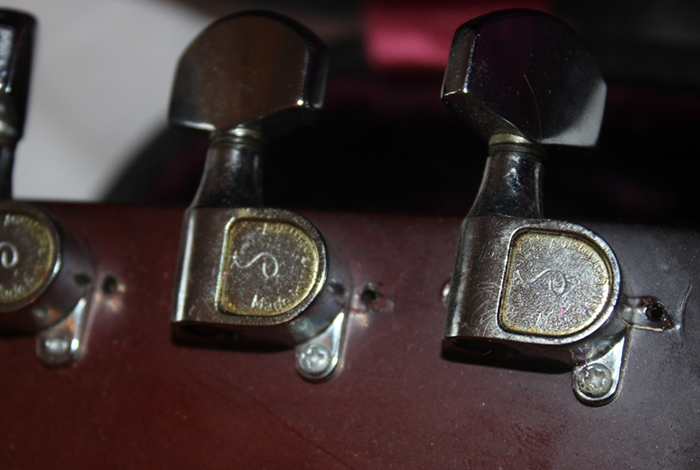 Fine tuning tailpiece: On Manny Charlton’s request, the original Gibson stop bar tailpiece was changed in favour of adding a Gibson TP-6 fine tuning tailpiece (made by Schaller for Gibson). This still works wonderfully, also helping the guitar stay in tune - even through aggressive playing. 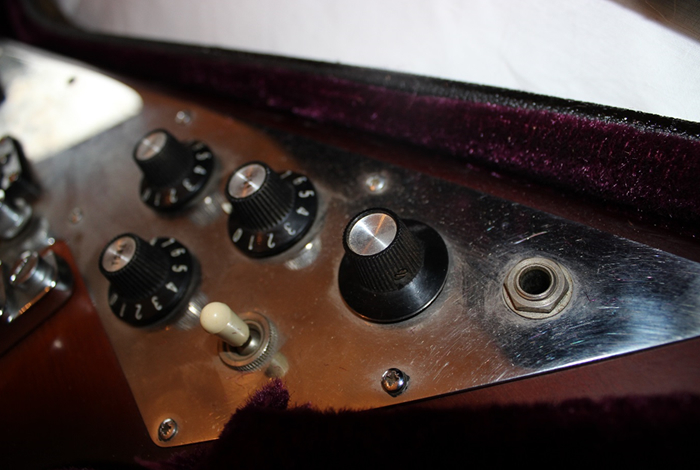 Electronics: two volume controls, one tone switch and a custom phase switch, fitted by English guitar luthier John Birch in 1976. The custom phase switch makes it possible to quickly change the tonality of the guitar. This can be achieved when the pick-up selector is in the middle position (when using both pick-ups). This phase switch reverses the neck pickup phase (ground becomes hot, and hot becomes ground), so frequencies in common with the bridge pickup tend to cancel. This tonal change has no active electronics, yet gives a distinctive, scooped sound that works well with both clean and distorted amp settings. Pick ups: DiMarzio Super Distortion Humbuckers - retrofitted by John Birch. Pickguard: Blank chrome metal pickguard - a custom plate made by John Birch. Body: solid mahogany wood, re-finished in a dark sunburst color by John Birch. Fretboard: custom, lacquered fretboard makes for faster and easier playing. 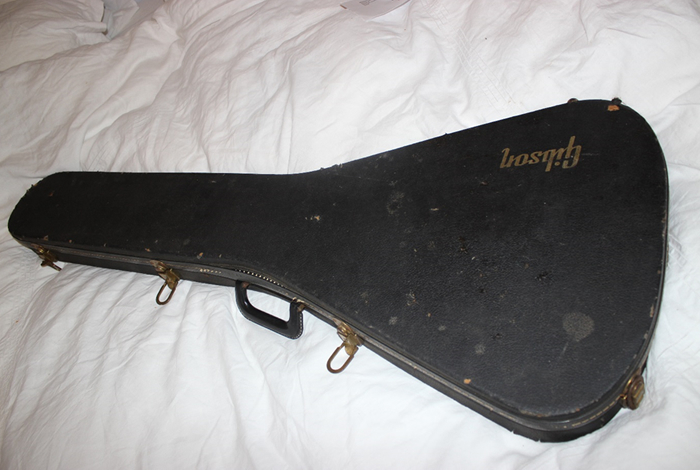 Guitar case: Original Gibson Flying V hardshell guitar case with a deep purple lining. 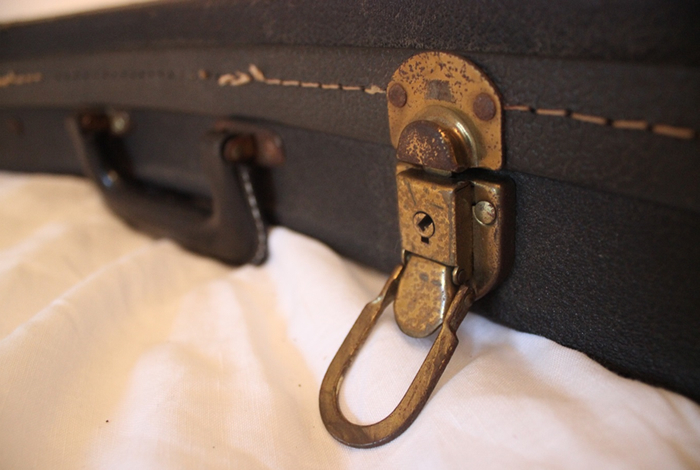 The guitar case exterior bears the hallmarks of a lot of touring, and the locks are oxydated, but works perfectly. 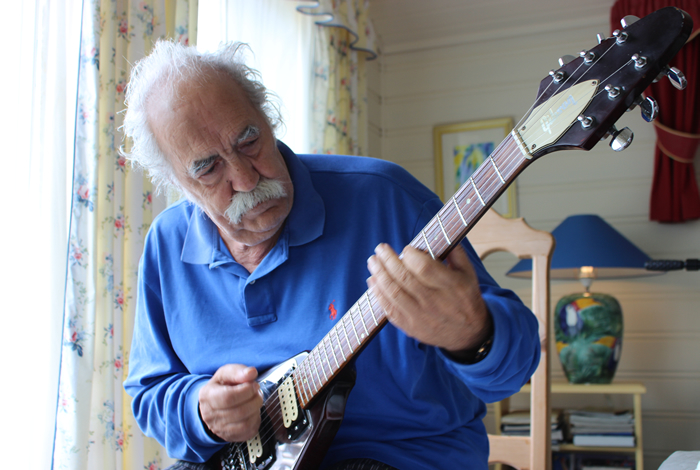 The guitar still looks and plays great, though with many marks and dings, coming from a life on the road with Nazareth. The pictures on this page were taken in May 2015. The serial number is quite hard to decipher, because the guitar was re-painted in a dark sunburst colour by luthier John Birch in 1976. However, on close inspection, when held up in the light at a certain angle, the serial number at the back of the headstock is revealed number 525540. This guitar is of the 500000's series Gibson Flying V guitars, manufactured in the USA between 1974-1975, according to the official Gibson records. 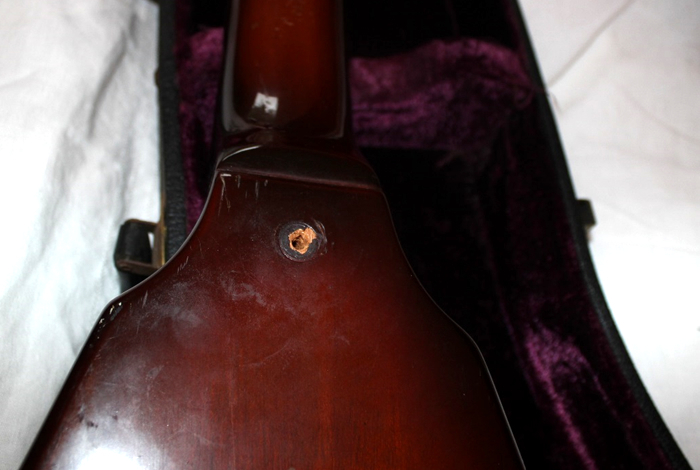 According to the knowlegable Gibson collector Tim Wittrock in the USA, the make of the fine tuning tailpiece is a Gibson TP-6 (made by Schaller for Gibson). 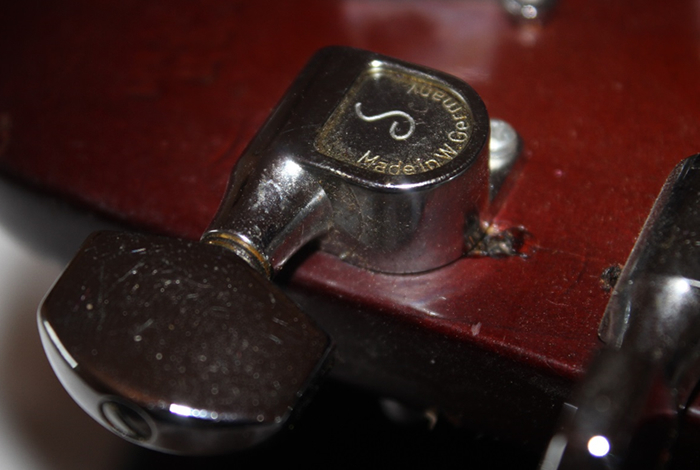 During a change of guitar strings, the back of the fine tuning tailpiece was pictured, confirming that it is a Gibson produced tailpiece and made in USA. PS: Manny Charlton used regular .010 gauge guitar strings on this guitar. The guitar is retrofitted with DiMarzio Super Distortion Humbuckers, which still sounds awesome. DiMarzio, Inc. (original name: DiMarzio Musical Instrument Pickups, Inc.) is a United States manufacturer best known for this Super Distortion model, which was the first after-market direct replacement guitar pickup. It was introduced in 1972 and is still one of the most popular models. The DiMarzio Super Distortion pickups became popular among rock guitarists in the 1970s due to their high output volume. These DiMarzio pickups was favored by artists such as David Gilmour (Pink Floyd), "Fast" Eddie Clarke (Motorhead), Ace Frehley (KISS), Jerry Garcia (The Grateful Dead) in the 1970's. More recent users include: Chris Broderick (Megadeth), Kurt Cobain (Nirvana), Billy Corgan (The Smashing Pumpkins), Eddie Van Halen (Van Halen), Eric Johnson, Steve Morse (Deep Purple), Yngwie Malmsteen, Phil Collen (Def Leppard), James “Munky” Shaffer (Korn), Noodles (The Offspring). Interestingly, the Schaller Machine heads fitted on this guitar have the inscription “Made In W Germany”, as these were made before the reunification of Germany in 1989. These Schaller machine heads were retro-fitted as can be seen from the previous screw-holes. Schaller Electronic GmbH, generally known as Schaller, is a high-end German manufacturer of components for musical instruments, most famous for their fully enclosed machine heads, which are standard on many top-of-the-line guitars and available as an extra cost option on many others. The company was founded by Helmut Schaller as a radio repair shop in 1945. Later they started to provide quality hardware for musicians, including Les Paul who Schaller met. Shaller also made special products on behalf of Gibson - like the Gibson TP-6 fine tuning tailpiece which is also seen on this guitar. Shaller are producing only in Germany at their location in Postbauer-Heng (Bavaria) and employ about 120 people (2006). John Birch added a phase switch which adds a different tonality option to the guitar. 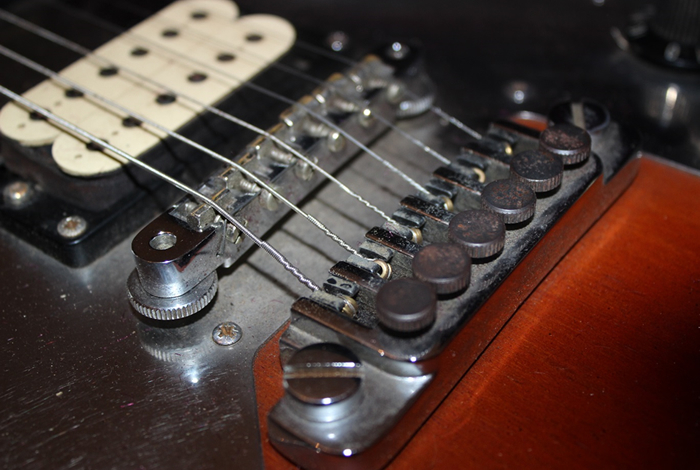 The out-of-phase sound can be activated when both humbuckers are in use (when the humbucker selector is in the middle position). The phase switch is pictured above: it is the closest control knob next to the input jack (black tophat with silver inset). As can be seen, the guitar strap screw is missing, and need replacing. 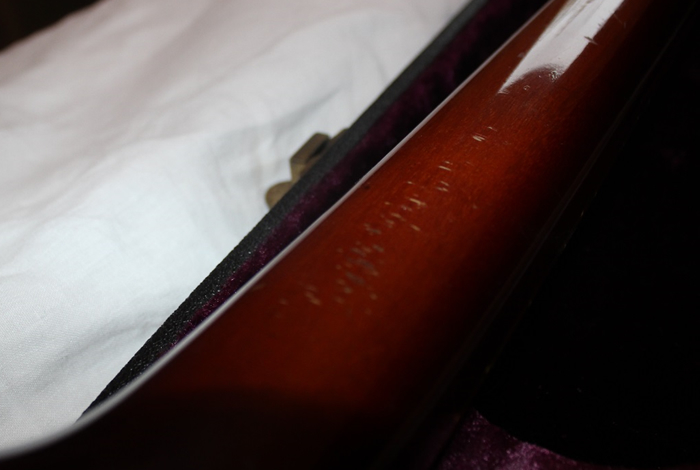 Marks on the lower neck of the guitar, probably from leaving the guitar standing up against a chair, amplifier or similar. 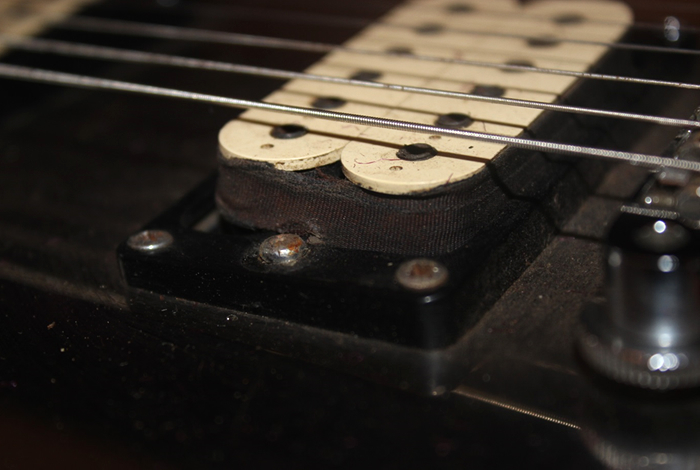 The plastic casing around one of the DiMarzio Super Distortion humbuckers is broken. Manny Charlton sold the guitar to The Fluffy Jackets' mainman on the 20th of April 2015 and autographed the guitar before shipping it to Norway from USA. 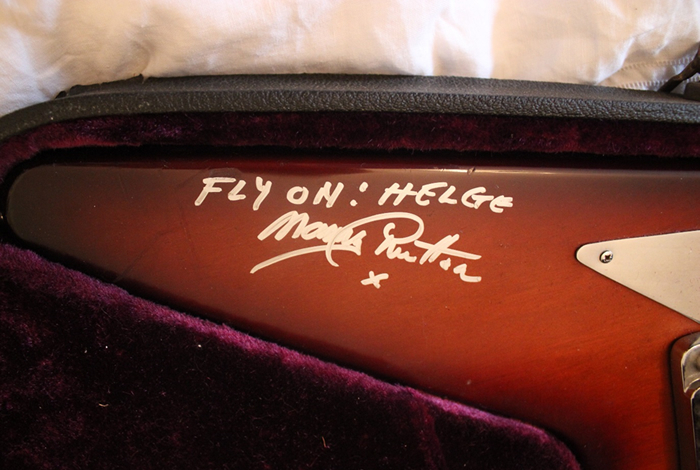 This autograph is located on the top tail of the V, and reads “FLY ON: HELGE, Manny Charlton x”. The shipment note and delivery invoice is included within the guitar case. 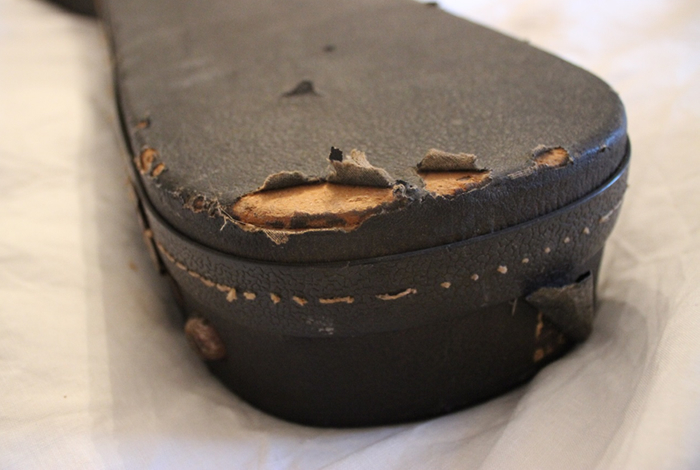 This original Gibson Flying V hardshell case came with the guitar when Manny Charlton bought the guitar in Tuscon Arizona in 1976. It has a deep purple interior. The locks are rusty but works fine. 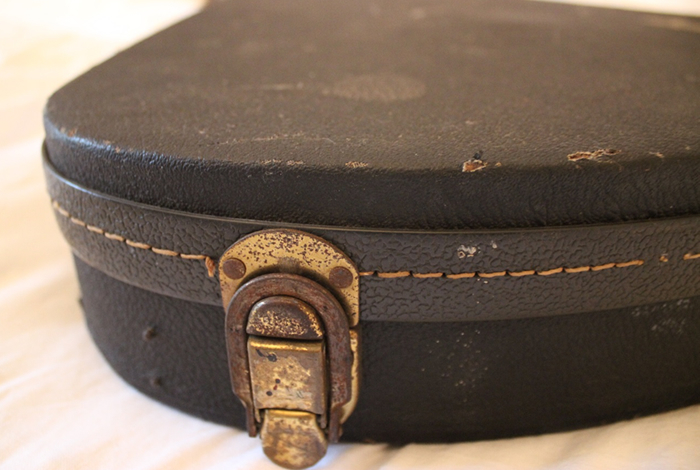 The guitar case is wearing the hallmarks of a life on the road with Nazareth. Gibson Flying V, Serial number 525540 (1974-75 mod) comes in its original Gibson hardshell case. 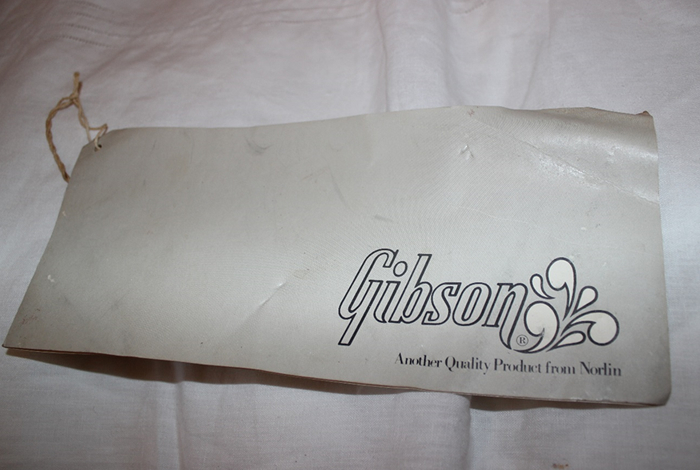 This original Gibson lifetime warranty document comes within the guitar case. 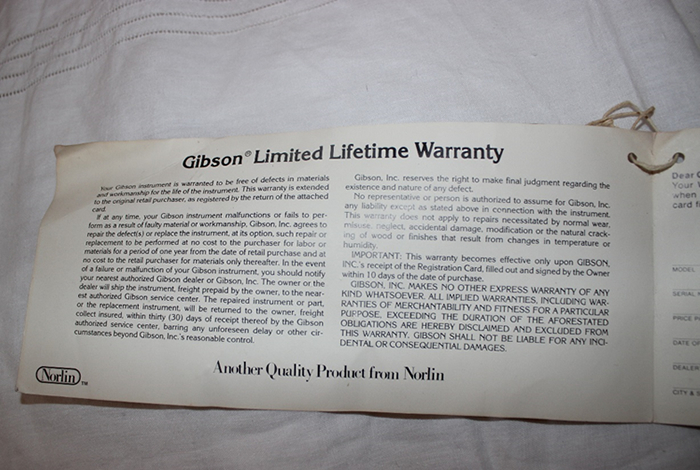 Gibson original lifetime warranty document from Gibson Norlin. On December 22, 1969, the Gibson parent company Chicago Musical Instruments was taken over by the South American brewing conglomerate ECL. Gibson remained under the control of CMI until 1974 when it became a subsidiary of Norlin Musical Instruments. Norlin Musical Instruments was a member of Norlin Industries which was named for ECL president Norton Stevens and CMI president Arnold Berlin. Between 1970 through 1983, the Gibson company was owned by a company called "Norlin Music Inc" and the guitars produced during this time has come to be known as "Norlin era" guitars. The Norlin era guitars had a bad reputation mainly due to the "corporate bean counters" who was in charge of the Gibson company at the time. Acting on a corporate drive to churn out "NEW! NEW! NEW!" guitars, the production line at Gibson delivered some wacky guitars, including the unsuccessful Gibson Marauder, Gibson Corvus and the S-1. However, not all Norlin-era produced Gibsons are bad. This is especially true for the classic Flying V guitar which Gibson Norlin brought back for resale in 1970s. 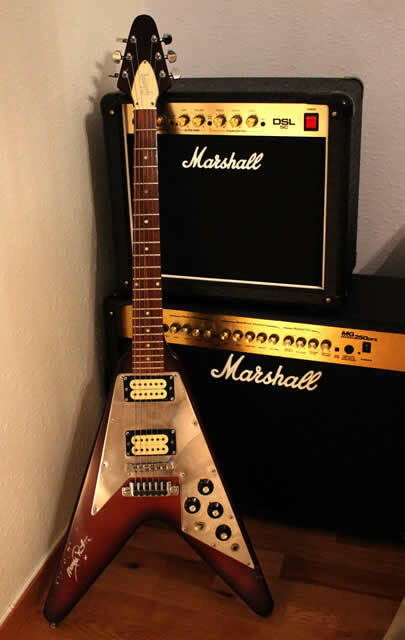 In fact, they are often dubbed as the best guitar that Norlin ever made: These Flying V guitars immediately gained considerable popularity, being used by emerging 1970's heavy rock bands such as KISS, Judas Priest, Scorpions - and later Metallica. The adoption of the 1970s heavy rock bands led to a re-invigored interest and a price jump for the first generation Flying V models. Today, a 1958-59 Gibson Flying V guitar is among the most valuable production-model guitars on the market: it was ranked at No.5 on the 2011 Top 25 published by Vintage Guitar Magazine. A good sample will set you back anywhere between $200,000 and $250,000. 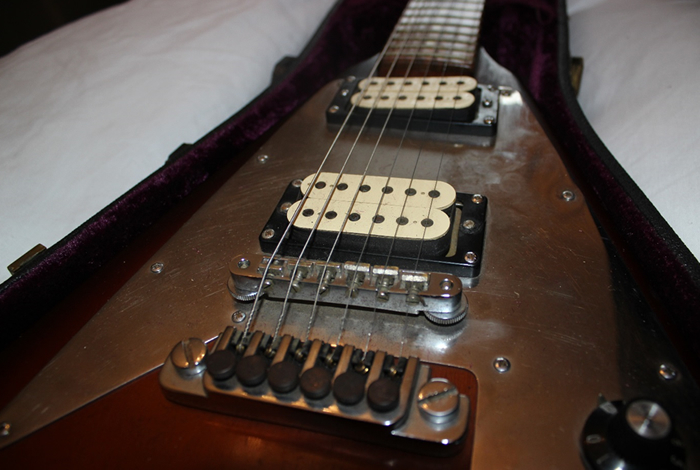 When Norlin brought back the Flying V design in the 1970s, the guitars were designed to look like the original Korina model of the late 1950s. 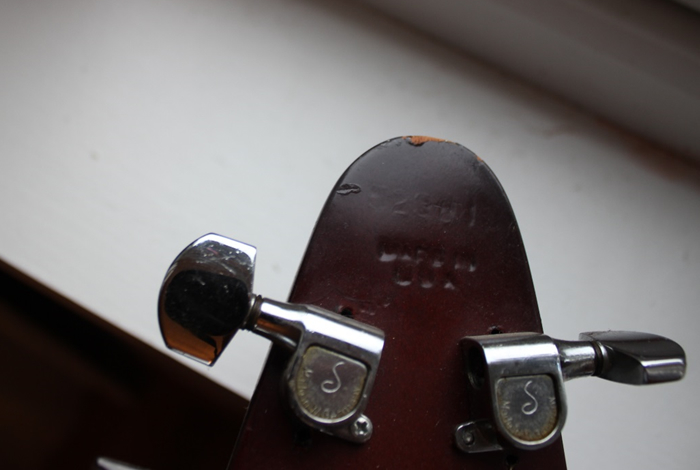 For example, the headstock is angled at 17 degrees to increase string pressure on the nut to increase the amount of sustain. 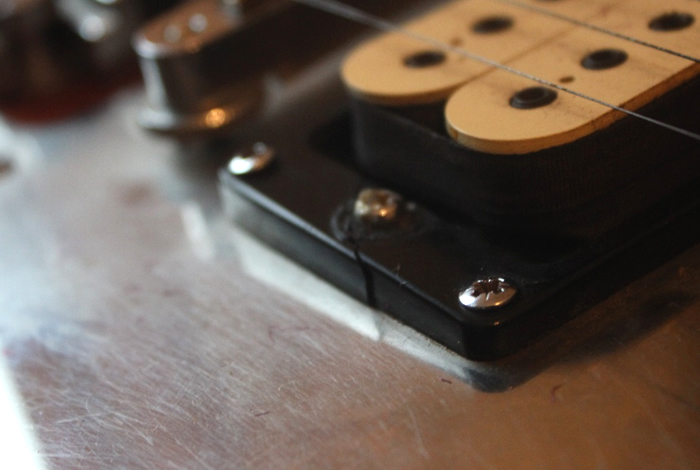 The pickups are placed near the center of mass of the entire guitar, further enhancing sustain. And - best of all - there was no "Nashville bridge" in these models, and there was no multipieces (the guitar body is made from one single cut of wood - unlike the less fortunate Les Pauls of that time). So, in short, this production model has proved very successful and the Gibson Flying V guitars has been in production ever since. PS. Another Gibson Flying V story: Metallica's Kirk Hammet paid for his black Gibson Flying V by washing dishes in a bum job. Quote from Kirk Hammet: “it's either a '74 or '75. It was my first Gibson, and it was $450. 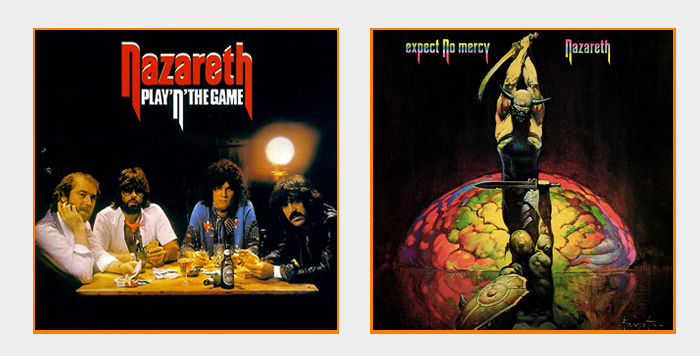 I played it in Exodus, and then I went on to play it on the first four Metallica albums and the accompanying tours. I don't take it out on the road anymore... it's really fragile now because of the weather and traveling.” (quote from the official Gibson webpage). Manny Charlton in action with Nazareth in 1977. This Gibson Flying V is a prime example of a hard rock guitar from the 1970's. Manny Charlton playing the same Gibson Flying V guitar in 2016 during a pre-production session for The Fluffy Jackets' second album. The picture is taken at Sotra island, just outside Bergen in Norway, August 2016. 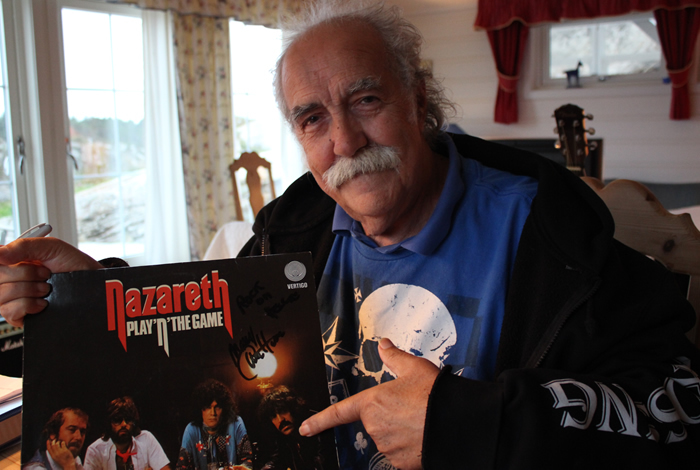 Manny Charlton with an authographed copy of Nazareth's Play'n The Game LP from 1976. The Gibson Flying V guitar can be heard on the tracks "Down Home Girl" and "Flying". Picture taken at Sotra island / Bergen in Norway, August 2016. Manny Charlton used this Gibson Flying V during a concert at Golders Green in London UK on the 3rd of December 1977, which was filmed for the BBC Sight and Sound TV Special. That footage was also later released as a DVD called "From The Beginning" (2005). The guitar can be seen and heard during "Hair of the Dog". Manny Charlton with Nazareth bandmate Pete Agnew during a BBC TV performance in 1977. Manny Charlton left Nazareth in 1990, and went on to record a string of solo albums. 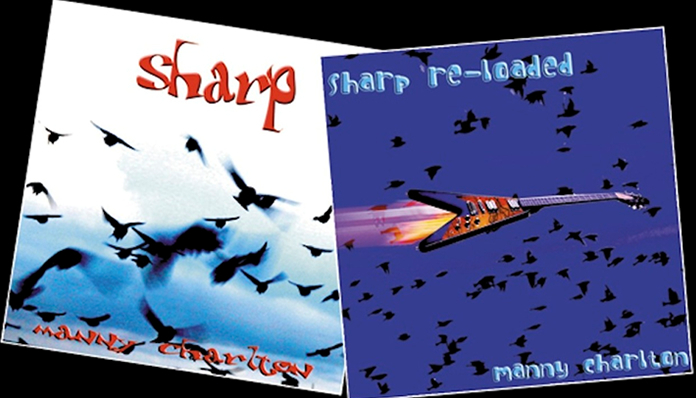 "Sharp" came out in 2004 featuring a cover of flying birds. 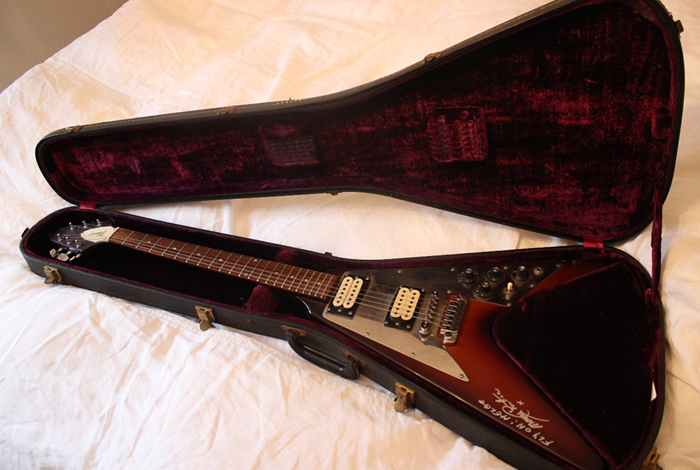 That album was followed in a matter of months by "Sharp Re-loaded" which feature an image of this very Gibson Flying V guitar on the album cover. 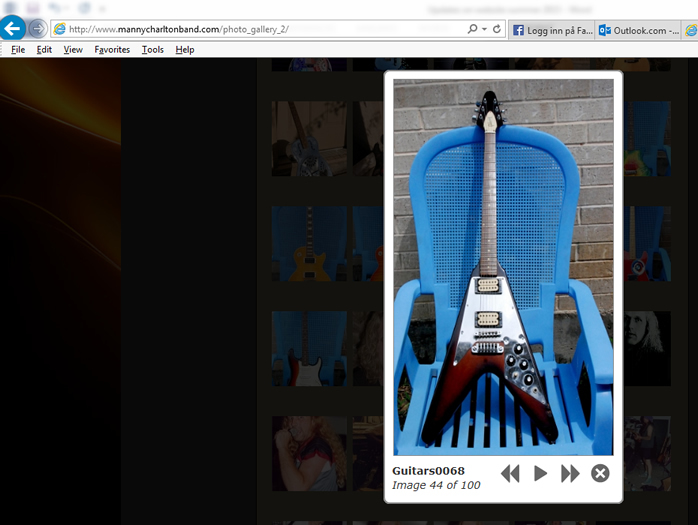 Even through some "magic" was done to the photo of the guitar in Photoshop, you can clearly see that the source image is of this Flying V guitar, evidenced by the extra phase switch, DiMarzio pickups and also the Gibson TP-6 fine tuning tailpiece. The Sharp and Sharp Re-loaded double CD package was released by Angel Air Records in 2014, featuring this Flying V guitar and comes highly reccommended! 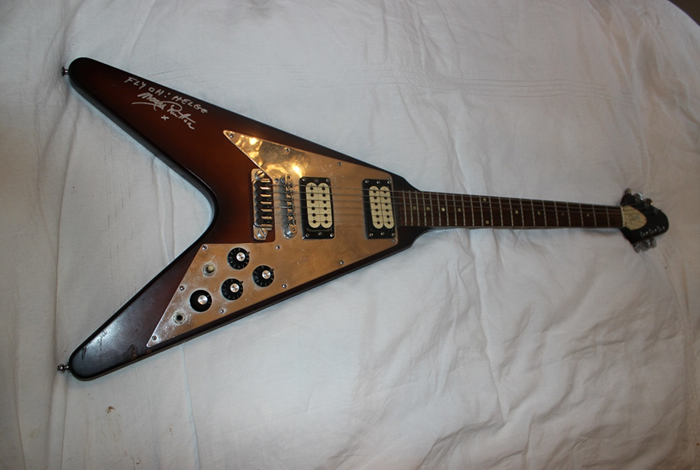 The above picture of the same Gibson Flying V guitar is taken from Manny Charlton Band webpage and shows the guitar before the guitar was adorned with Manny's autograph. This picture was taken outside Manny's home in Forth Worth, Texas USA, around 2010-11. This Gibson Flying V was used in many Nazareth tours in the late 1970's, including at the Anaheim Stadium in California on the 19th of June 1977. 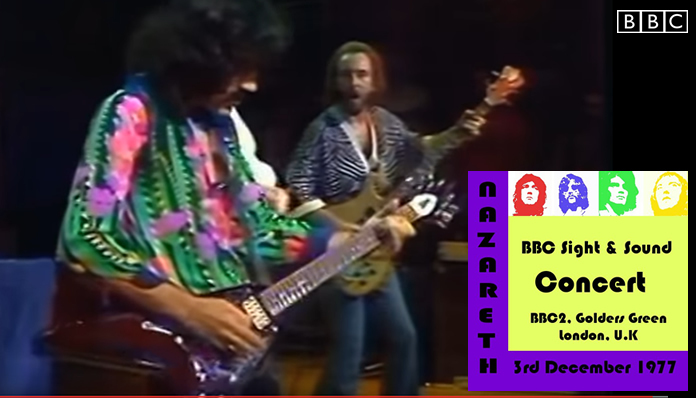 Here, Nazareth appeared on the "Alice Cooper and Friends" live music television special, starring Alice Cooper, Nazareth, The Tubes and Sha Na Na. The resulting footage was first shown in the United States in September 1977, and released on VHS in 1978. Manny Charlton can be seen playing this Gibson Flying V guitar on this recording - albeit very briefly - during the Love Hurts guitar solo. We have managed to track down a YouTube clip of this, and you can see this Flying V guitar in that footage at 6:30 min into the above video. Manny Charlton explained that he used this guitar on Kentucky Fried Blues (Expect No Mercy album, 1977), using the Bridge pick up on full volume / tone through a Gallen Kruger Amplifier and a Eventide H910 Harmonizer effect. Manny Charlton - for patience & taking the time to answer a lot of questions - not least remembering these things! Manny is a class act - in more ways than one. Tom Wittrock - the legendary guitar collector, player and one of the world’s leading authorities on Gibson guitars - for invaluable help in determining the make of the Gibson TP-6 fine tuning tailpiece on this guitar (made by Schaller for Gibson). Tom also happens to be the owner of many famous 1958-1960 Gibson Les Pauls which is pretty much the holy grail of guitars, incl. the original "Donna" (Gibson Collectors Choice #5), "Sandy" (Gibson Collectors Choice #4) + he is also the previous owner of Goldie (Gibson Collectors Choice #2) and a whole host of other famous Gibson guitars - many still in his collection. I am indebted for a lot of great information from him. Wikipedia - for information about John Birch (luthier), Schaller music company, DiMarzio pick ups and many more things! 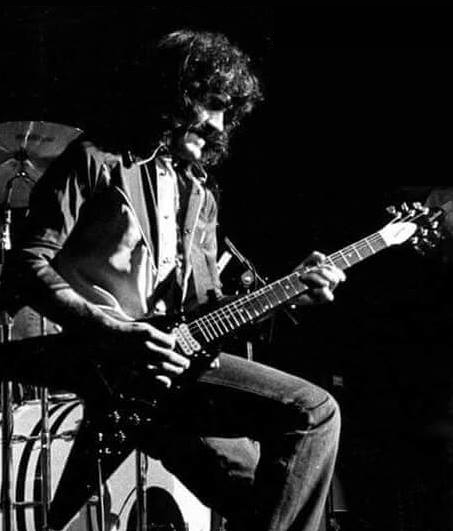 Manuel "Manny" Charlton (born 25 July 1941), the founding member of the Scottish hard rock band Nazareth and their lead guitarist from 1968 to 1990. Manny Charlton (Nazareth) on Wikipedia. John Birch (1922 – November 6, 2000), the English luthier known for his electric guitars.